Cape Town, Friday 6 April 2018 – An article published today in The Astrophysical Journal presents the study of a magnetar – a star that is one of the most magnetic objects known in the universe – that awoke in 2017 from a 3-year slumber. 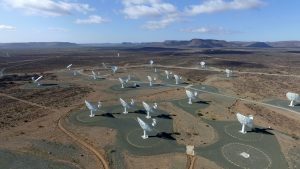 Radio observations that could only be made with MeerKAT, an SKA precursor telescope being built in the Northern Cape province of South Africa, triggered observations with NASA X-ray telescopes orbiting the Earth. This first publication in the scientific literature of astronomical discoveries requiring the use of MeerKAT heralds its arrival into the stable of world-class research instruments. “Well done to my colleagues in South Africa for this outstanding achievement”, declares Prof Phil Diamond, Director-General of the SKA Organisation leading the development of the Square Kilometre Array. “Building such telescopes is extremely difficult,” adds Diamond, “and this publication shows that MeerKAT is becoming ready for business. As one of the SKA precursor telescopes, this bodes well for the SKA. 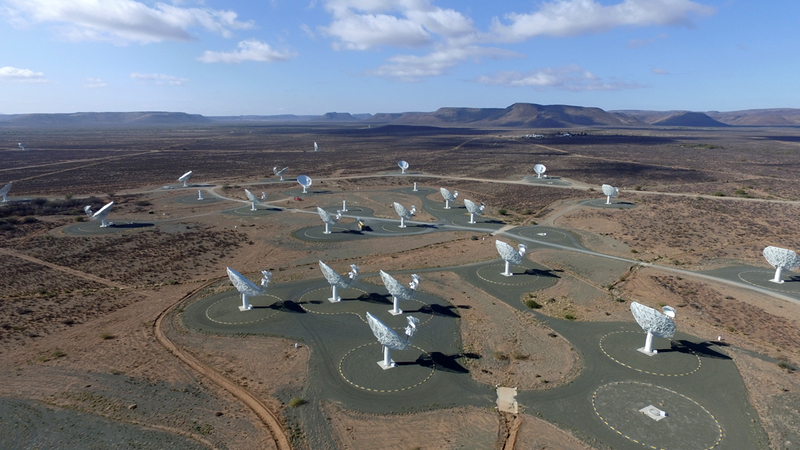 MeerKAT will eventually be integrated into Phase 1 of SKA-mid telescope bringing the total dishes at our disposal to 197, creating the most powerful radio telescope on the planet”. MeerKAT includes 64 dishes, each 13.5 metres in diameter, distributed across a span of 8 kilometres in a remote area of the Northern Cape in South Africa. “It’s been a long road getting to this point”, notes Dr Rob Adam, SARAO Managing Director. “It’s required the hard work and support of countless South Africans over more than a decade”. “We’re nearly there with MeerKAT”, continues Adam. “As this first article indicates, the telescope is now beginning to make scientific discoveries. As MeerKAT’s capabilities continue to grow, many more will follow”. “It’s tremendously gratifying to lead a team of such talented and passionate colleagues, who’ve been building in the Karoo a research instrument with few parallels anywhere”, concludes Adam. Read the full article on the South African Radio Astronomy Observatory website.